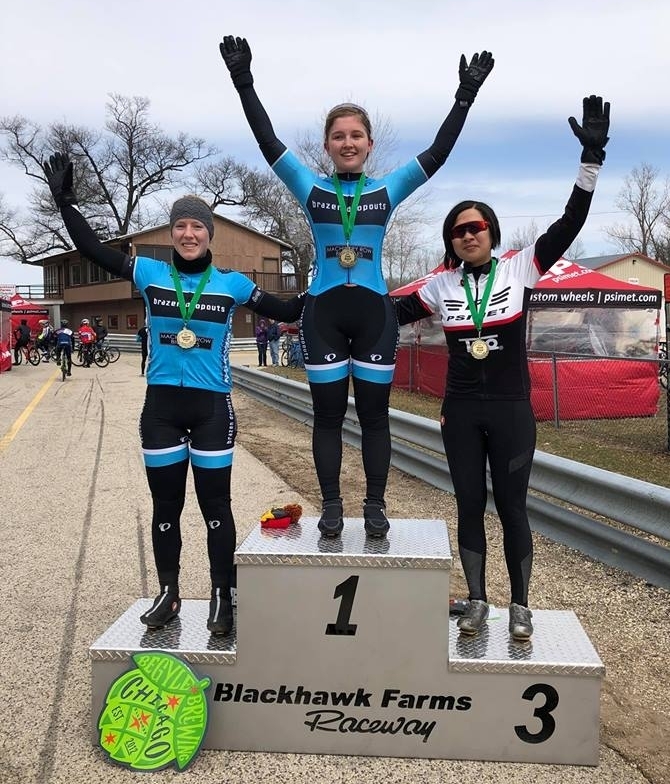 While there's currently snow on the ground in Wisconsin, a few BD's made it down to the Spring Super Criterium in South Beloit, IL on April 8th. In the Cat 4/5 women, Olivia Cope and Kaitlyn Agnew took 1st and 2nd! Olivia recently spent a week training in North Carolina with the UW-Madison Cycling Team, putting her in prime shape for the season ahead. It was Kaitlyn's first race ever, but her dedication to off-season training and attending the team training trip really showed. In the Cat 3 race, Ben Grabow rode smart to a solid 3rd place. In three appearances at this race since 2014, he's 2 for 3 for podiums so it's apparent he really knows the course and what to expect for the early season. Check out our new Pearl Izumi kits/racesuits! Next up: the Whitnall Park Spring Classic Criterium (WCA) in Milwaukee!